A footwear company has apologised for displaying the sacred Hindu 'Om' symbol inside its sandals and withdrawn the offending product. Laceys footwear, in London, made the decision after it received complaints from the Hindu community. 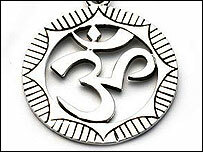 The symbol is considered to be a manifestation of God. Ramesh Kalidai, secretary general of the Hindu Forum of Britain, said it is considered "deeply offensive" for people to "step" on the symbol. The storm began after a member of the Hindu community spotted the sandals, which feature the symbol on the insole, in a shoe shop in Shepherds Bush Market, London. The matter was then brought to the attention of the Hindu Forum. Mr Kalidai said: "Hindus in Britain and around the world are shocked that a sacred symbol is being used in such an insensitive manner." The footwear company has acted swiftly to end the controversy. Michael Ridgway, a spokesman for, Laceys said: "I apologise on behalf of Laceys Footwear for any offence or hurt the design on the sandal has caused to any member of the Hindu community. "We were completely unaware that the design could be read as a mirror image of the symbol. We are acting immediately to withdraw this shoe from sale." Several designers have provoked anger after being attracted by the richness of Hindu iconography. In June London department store Harrods apologised to its customers for selling underwear bearing images of Hindu goddesses. The controversy began when an Indian human resources executive saw mannequins bearing the brightly coloured bikinis. Harrods removed the underwear and swimwear range from sale after a protest by a Hindu pressure group. Hindu Human Rights said the garments, created by Italian designer Roberto Cavalli, insulted the religion. And last year another department store had to apologise for selling toilet seats with images of a Hindu deity.